Racing Hero: Mike Heideman - he's a great guy and an awesome driver! Crew: Shawn Kracke, Brian Schmidt, Eric Bartels, Eric Clifford, Chris Clifford, Brock Johnson, Sadye Wollenburg. Sponsors & Support: I'd like to thank my parents, my crew, and all of my sponsors, especially Bartels Racing Chassis and Clifford Racing Engines. Without them I don't know what I would do. 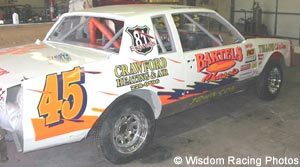 2001 Crusier Best Appearing Car Award, 2002 Hobby Stock Best Appearing Car Award, 9th place in 2002 Super Nationals, 8th place in Tiny Lund Memorial Race, October Fest winner, 7 2002 Feature wins, 5th place in National Rookie Points. I have been around racing for many years as I started going to the races with my uncle when I was five. When I got older I helped Scott Boyer pit. A few years ago I decided it was time to put to use all I had learned helping in the pits so started racing Cruisers. I raced Cruisers for two years and won a race in my 3rd year. We won the A Feature the first night out of that year and had another team file a claim which we turned down. This is when I decided it was time to go on my own and moved up to Hobby Stock.